After graduating from the University of Alberta School of Medicine in 1960 and marrying Joy in 1961, they moved to Pittsburgh Pa where Bill was trained as a child and adolescent psychiatrist. He was drafted into the US Army Medical Corps and they relocated to California for two years of active duty. They returned to Pittsburgh where Bill was on the faculty of the University for 8 years. A move took them to Rochester, PA where he was director of the Mental Health Center. In 1986, they moved to Owensboro and Bill was the Medical Director of River Valley Hospital. He retired from there in 2000. 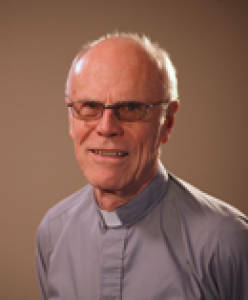 In 2005, he began discerning a vocation to the permanent diaconate. Bill was ordained September 15, 2012. Bill & Joy have been members of Blessed Mother Church since 1987. As deacon, he proclaims the gospel when serving at the altar and announces the prayers of the faithful. About every 5 weeks he preaches the homily. He can baptize, perform mixed marriages, bless people, homes and religious objects. Bill is on the RCIA team and trains Eucharistic ministers. Bill & Joy have five married children and sixteen grandchildren.